Not uncommonly, a patient can present with complaints of tinnitus, clogged ears, and hearing loss influenced by jaw movement. Specifically, opening or clenching the mouth excessively makes the tinnitus and clogged ear sensation worse. Relaxing the jaw decreases these symptoms. For some ear symptoms, contraction of the middle ear muscles (stapedius and tensor tympani) may contribute to "muffling" of sounds. Inflammation of the jaw joint can lead to ear pain... but some other ear symptoms like tinnitus and clogged ear sensation are harder to explain. With such symptoms, it has always been unclear what the exact physical mechanism is behind these two complaints although the temporomandibular joint (TMJ) has always been felt to be the root suspect. Even though the exact mechanism is unknown, treatment that helps include myringotomy and/or TMJ rehabilitation. However, a paper published May 2016 may have figured out the exact mechanism behind how the TMJ influences tinnitus and clogged ear sensation. In this particular patient, jaw opening exacerbated tinnitus and clogged ear sensation. Researchers performed a high resolution CT scan of the TMJ with mouth in both closed and open position. 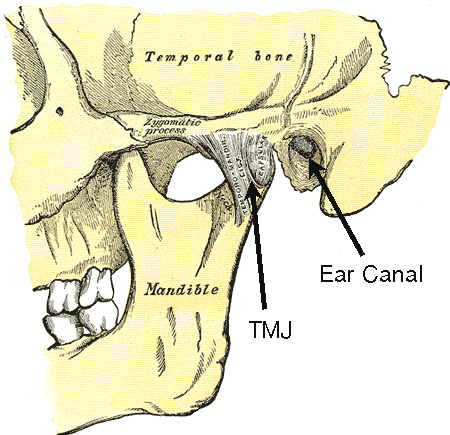 What they discovered was a connection between the mandibular TMJ fossa and middle ear space as revealed by a gas collection around the joint capsule with and without mouth closed position. With mouth widely opened, a gas bubble developed in the joint capsule. With mouth closed, this resolved. The question than becomes how did air from the middle ear space get sucked into the jaw joint capsule? According to this paper, based on CT scan, the petrotympanic fissure is thought to be the tunnel connecting the middle ear space to the TMJ (see image below denoted by **). Normally, this fissure should be closed, but in this patient, was found to be patent allowing a communication between the ear and TMJ. The jaw movement was felt to act like a hydraulic pump sucking air in and out between the middle ear and joint capsule. Creating a hole in the eardrum completely resolved this patient's ear symptoms by eliminating the pressure differential across the eardrum. 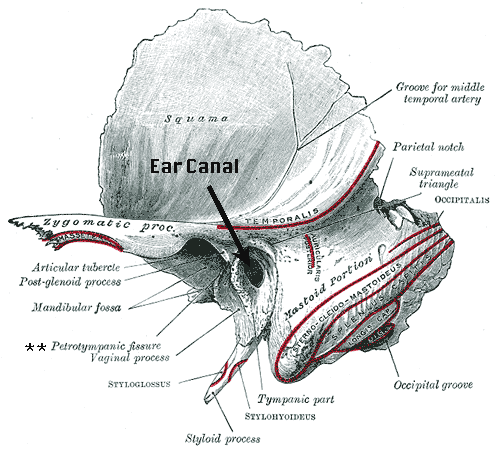 However, now that the anatomic basis for jaw movement leading to ear symptoms has been figured out, potential other therapeutic options may become available (i.e., surgical closure of the petrotympanic fissure). Of course, there may be more than one cause for ear symptoms due to the TMJ, but this is a good first step! I shall start following your blogs with interest. I have suffered from tinnitus for 20 years and then about 6 months ago I developed a ticking ear. The two together are intensely irritating so if there is any solution on the horizon I would like to know about it.